The Simple Flower Embosslits Die is another goodie that will be leaving us at the end of the month. So sad to see these items leave us but it also paves the way for all the new goodies head our way! I sponged Daffodil Delight in the center of each flower, cut around one side of one petal of each flower added a Old Olive brad to each center. By cutting one slice of one petal on each flower gave me the ability to nestle them together (or over-lap) a little closer. For a little texture I used both W. White and D. Delight textured card stocks. The contrast really happened when I stamped the sentiment in BLACK with the addition of black halfbacks just underneath. Just underneath the petal where I made my single cut, I placed a dimesional which gave each flower more depth. Can you tell here looking at the side view? 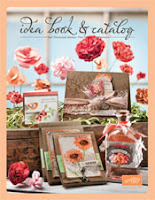 Tools – Simple Flower Die, Little Leaves Die, Beautiful Wings Die and Scalloped Edge Border. THANKS FOR STOPPING BY TODAY !!! So very pretty. Great way to do the flowers and I like the inside. I totally love this particular card!! And I love the simple flower embosslit as well. Thank you so much for sharing. fabulous flowers Linda ~ TFS and have a wonderful evening! Your cards are always so pretty inside and out! Love how you displayed your flowers ... gorgeous! Beautiful, Linda! This is probably the prettiest card I have ever seen made with this embosslit. I love the color combination. Very pretty! I love those SU dies! Very beautiful card, love the flowers and colors!! !